Gorton Bailey Randall was born on September 5, 1813 in Johnston, Providence County, RI, the fourth son and seventh child of George W. Randall and Betsey W. Keene. 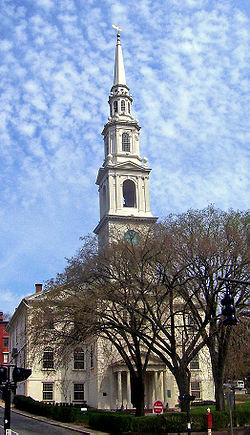 On December 15, 1836 he married Mary Ann Gardiner (or Gardner) in Providence, Providence County, RI. Mary Ann was the daughter of Benjamin and Elizabeth (“Betsey”) Gardiner and was born on March 18, 1814 in North Kingstown, Washington County, RI. Sadly, that is all I know about her family. Gorton and Mary Ann lived in Johnston through about 1852 when they moved to Providence. I assume they must have done so to be closer to Gorton’s work at Peck’s Wharf on the Providence River, which flowed into Narragansett Bay. Gorton worked as a cooper, which is a barrel maker. 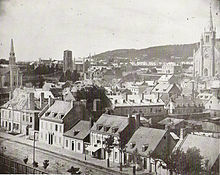 For a period during the early 1860’s, Gorton also worked with his older brother James. From what I can see, Peck’s Wharf had a variety of businesses that must have had need of barrels for shipping out from the wharf. 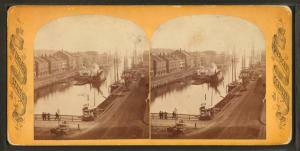 Stereoscope of the Providence River with wharves. Courtesy New York Public Library. Mary Elizabeth, born August 7, 1837, who I’ve written about here. Harriet, born May 6, 1840 and died February 20, 1842. Her grave is in Woodlawn Cemetery. Harriet Sanford, born June 4, 1843; married May 27, 1863 to Benjamin F. Brown. They had five children, the two oldest of which died as young teenagers. Harriet died in 1924 and is buried with Benjamin in Woodlawn Cemetery. Georgiana (“Anna”), born December 24, 1844; married Albert Eddy on May 7, 1864 in Providence. They appear to have separated by 1880 and were likely divorced at some point. Anna supported herself as a dressmaker and later lived with her single younger sister Nellie. She died on April 19, 1927 in Providence and was buried at Woodlawn Cemetery. Emma E., born circa 1848 and died before 1860. The only evidence I have of her life is her presence on the 1850 Census. Nellie Gorton, born February 1, 1861. [Yes, this was a long time after Emma was born, but as far as I can find, Nellie was Gorton and Mary Ann’s daughter.] According to Aunt Genie (whose sister-in-law Altie May (Williams) Atwell apparently boarded with Gorton’s family at one time), Nellie was “tall and pretty”, but an invalid later in life. Perhaps Georgiana helped care for Nellie. Nellie died on September 4, 1932, supposedly in Stamford, Fairfield County, CT. She, like the rest of the family, was buried at Woodlawn Cemetery. Mary Ann died on June 7, 1887 in Providence, just four days before her granddaughter Minnie Cooley; perhaps they had the same illness? Gorton died on August 25, 1891. Both he and Mary Ann were buried at Woodlawn Cemetery. One of these days, I need to visit the cemetery and pay my respects to this big branch of my family. Normally, I would go on to write about my great-great grandmother Altie May (Williams) Atwell, but much of her story is covered in my post about her husband. I can say that prior to marrying William Armstrong Atwell, she was employed as a boxmaker. She also has the distinction of being doubly enumerated in the 1880 Census: first boarding in Providence with the Denison Reynolds family, then later in June with her own family in Johnston, Providence County, RI. So I will move on to her parents, who may give a better background on Altie’s life. The only source I have for the origins of John Wesley Williams is the book Randall and Allied Families, which states that he was born on April 25, 1837 in Cambridge, Washington County, NY to Jason and Lucy Williams. The 1840 Census does show a Jason Williams in Cambridge whose household does have a male under the age of six, so I have no reason to doubt this source. Randall and Allied Families also states that John married Mary Elizabeth Randall on December 5, 1859. This fact, too, is supported by their presence in the 1860 Census, marked as having been married within the year. Mary was the oldest child of Gorton Bailey Randall and Mary Ann Gardiner. She was born on August 7, 1837 in Providence, Providence County, RI. Although the 1860 Census states that John was a painter, every other record I’ve found (directories, censuses) shows him to be a mason. This has made it easier to pick him out from other John Williams in the area. Altie May, born November 30, 1863 in Providence. Charles Weston, born February 26, 1869; married Mary Elizabeth Pilou (or at least, that is the only spelling I’ve found) on June 19, 1890; occupied as a house painter; died April 21, 1926. Harry Clinton, born January 13, 1874; married Catherine _____ in 1897; occupied as a sign painter. Sometime between 1880 and 1885, John and Mary separated. The a885 Census seems to indicate that Mary had custody of Charles and Harry (although that census does not list family units – just individual names – Mary is listed as head of household). As I’ve written before, Mary lived for a time with her daughter’s family during the 1890s. In the 1900 Census she lived with her son Harry and his wife, and her marital status is shown as widowed. At first I thought that John had died, but the 1903 and subsequent city directories show him as living with his son Charles and his family. In fact, the 1910 Census states that he was divorced! (The truth comes out!) I later found out that stating that one was widowed kind of avoided the social stigma as being known as divorced, so that explains Mary’s status. Just these little bits of information raise so many questions for me: Why divorce after about twenty-five years of marriage (especially in the 1800s)? How did this impact Altie May and her later divorce from William? Since John and Mary each were living with different sons, how did that affect Charles’ and Harry’s relationship? John passed away on October 14, 1918 (I assume in Providence). So far, I haven’t been able to tell where he is buried. Mary died on June 20, 1919 in Providence and is buried with her parents and other ancestors in Woodlawn Cemetery, Johnston County, RI. Ida Elizabeth Atwell was the second living daughter of William Armstrong Atwell and Altie May Williams. She was born on January 20, 1890 in Providence, Providence County, RI. Like her sister Winifred Margaret, she completed four years of high school, then entered the working world. The 1910 Census showed her as a bookkeeper at an “installment co.”. From 1911 until 1914, she worked as a cashier. On February 11, 1914, Ida married James Garfield Dilworth, a manager from Worcester, Worcester County, MA. I’m not sure how they met; perhaps his business worked with hers? 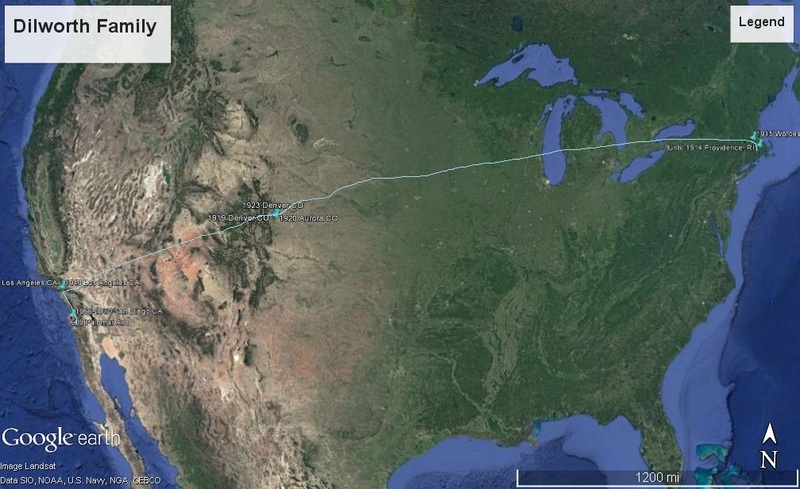 In any case, this was the beginning of their lives together, travelling across the country. Ida and James remained in Worcester at first for the birth of their first child, Richard A., on January 10, 1915. By 1919, the family had moved to Colorado, first to Denver, then to Aurora, Adams County (which is right next to Denver) in 1920. Here is where their second child, James Garfield, Jr., was born on October 30, 1920. 1923 found the Dilworth family back in Denver, but by 1930, they moved to their final state, California. They lived in various locations in the Los Angeles area throughout the 1930s and in 1940, always in a cute little house. I have to wonder if Ida’s sister Margaret Armstrong was instrumental in getting them to move to this area. Perhaps the sisters had plenty of get-togethers. Just three short months after the 1940 Census, James died on July 21. Eventually, Ida made her way to San Diego. There she remained until her death on December 3, 1970. Having lived so recently, I don’t know whether Ida’s sons ever got married or had children. I do know that Richard died on May 7, 1991 in Prescott, Yavapai County, AZ. James, Jr. died August 7, 1990 in Pacific County, WA. He is buried at Fern Hill Cemetery in Menlo, WA. So why did the Dilworths move around so much? It’s hard to tell, as James, Sr. held down a variety of jobs, such as manufacturing, sales, insurance and real estate. Perhaps he was simply taking opportunities as they presented themselves. The Dilworth’s moves spanned the continent! Courtesy Google Earth.